Under sink water filters can greatly reduce the number of contaminants found in your tap water. These units are usually large, but they work tirelessly to keep your water tasting better. We’ve done our research to bring you the top ten under sink water filters on the market. Choose the one that works well for your home! But before we get started, here are some things you should know about under sink water filters. Filter Capacity: The filter portion of these systems only last a certain amount of time before they need to be replaced. Here, we’ll tell you how long a single filter will last before it needs to be replaced. Contaminant Removal: What percentage of contaminants does the filtration system remove from your water? We’ll let you know here. Higher percentages are usually better and we’ll give you some idea of what it removes in the description. Flow Rate: How fast does water flow through the filtration system? It’s important to know that your water won’t flow to a stop just because you’re using a filter, so we’ll let you know here how fast it will go. Stages: This refers to the number of filtration stages in the filter. 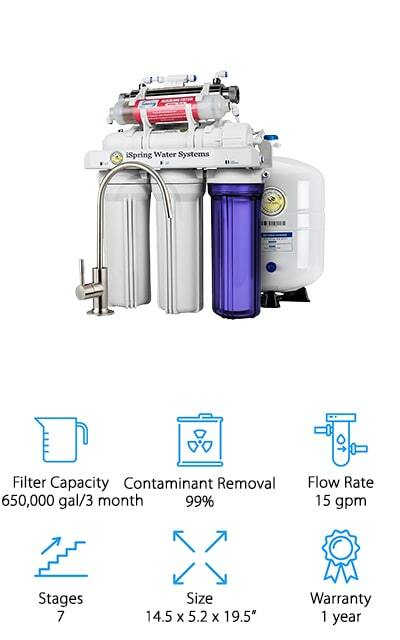 Some of these systems have a single, powerful stage that removes most contaminants, while others use multi-stage filtration. Multi-stage filtration does not automatically mean it’s more effective. Size: How big is the under sink filter? You’re going to of course want on that will fit in the space under your sink. Measure it out and keep this in mind when you’re ordering your filtration system. Warranty: If your system breaks or doesn’t function correction during the time period here, you can get a refund or replacement system. This means that a company stands behind their product and is committed to providing quality. With that information, we can get going with our best under sink water filter system reviews. These are the best of the best, and we are sure that you will find the perfect filtration system for your home on our list. The top pick and budget pick are the highlights (and our personal favorites), so give those a try before moving on to the rest of the systems on our list. iSpring comes in at the top of our reverse osmosis under sink water filtration system reviews. It boasts that it filters in a way that some of the other filters on our list don’t. Reverse osmosis is a process that uses pressure to get contaminants out of your water. There are seven stages that your water goes through before it reaches you, including sterilization. 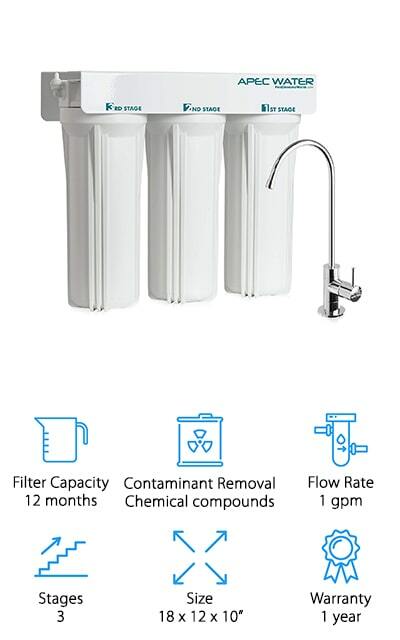 This filter will remove 99% of 1,000 contaminants, including chlorine, fluoride, asbestos, sodium, and microorganisms. It also removes 98% of lead, so your water will taste better. It softens your water so you no longer get spots on your dishes or residue in your sink. Ice made from this ice will be clear and perfect, and your cooking will taste that much better. The sterilization stage includes an 11 watt UV lamp which turns on and off with the flow of the water. You can use it for under sink water filter fluoride removal, too. 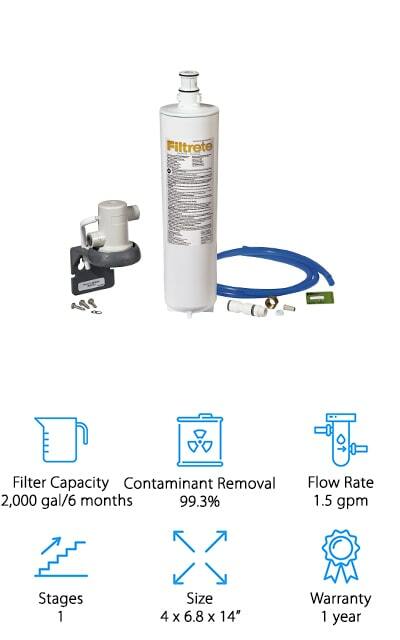 Filtrete makes our best affordable under sink water filtration system. It helps to reduce the number of microbial cysts and chlorine, as well as dirt and rust from your water supply. There is no dedicated faucet for this filter, unlike some of the others on our list. You can connect it right to the existing faucet to start getting soft, great-tasting water immediately. The filter will last up to six months or through 2,000 gallons of water, whichever comes first. You can easily install this system yourself in less than 30 minutes! 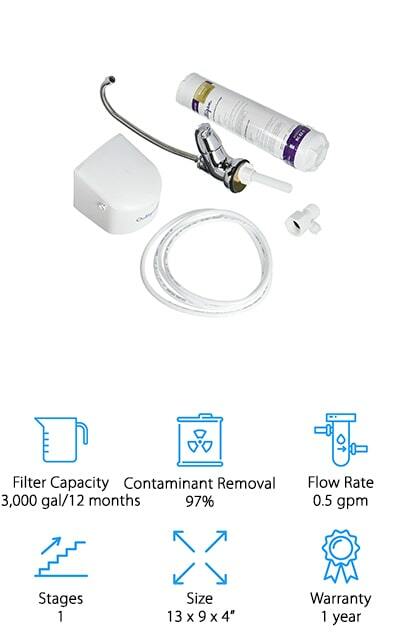 The best part about this filter is the fact that it won’t cut down on your water’s flow rate. It maintains the standard 1.5 gallons per minute rate that most faucets already have. Filtrete’s Maximum, Advanced, and Standard filters are interchangeable, so you can easily upgrade for a better filtration experience if the standard filter isn’t cutting it for you. It helps remove 99.3% of lead! This under sink filtration system has an innovative design for the entire process, giving you a better overall filtration experience. 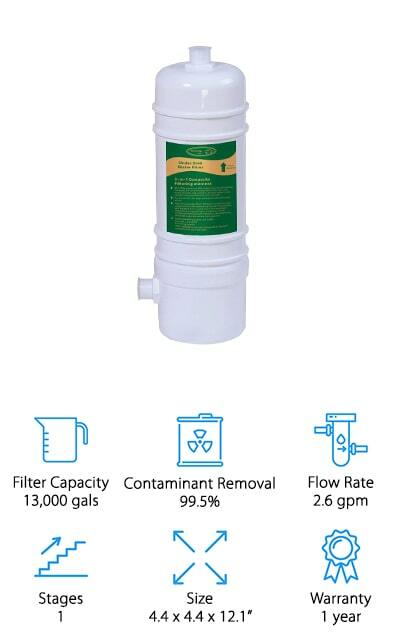 If you want to remove 98% of chloramine and other chemicals from your water, go with this filter! Along with pure water, it will also be softer, easier on your skin and dishes, and carry very little iron. The pH limit on this filter is between 4 and 10, so you aren’t going to get water that’s too acidic. The Full Contact technology adds calcium and magnesium in the purification process, so the water that you’re getting from the system is healthier than bottled. It doesn’t get much better than this! The filters last a year or 2,000 gallons, whichever comes first, and they are easy to change within the unit itself. There’s no hassle involved when you need to change the filter. The flow rate of your water will be twice as fast as most other filters! 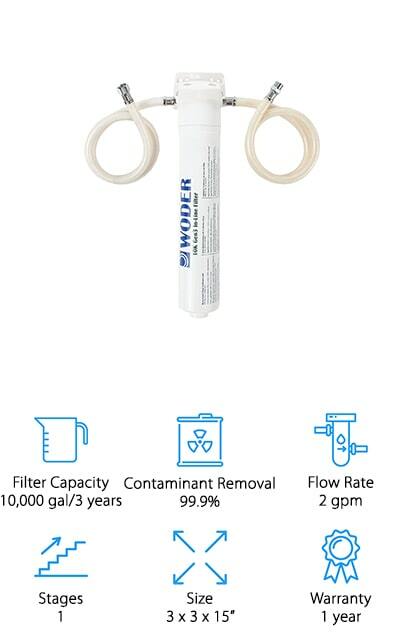 Woder is the right choice for purifying your city water system. If you need cold drinking water and don’t want to bother with filters that need to be replaced every month, choose the Woder 10k-Gen 3 System. This filter will last you a minimum of 3 years, or 10,000 gallons of cool, clear water. It has directly connected hoses that fit most bathroom sinks and attaches directly to cold water valves so that you don’t have to call a plumber for installation. 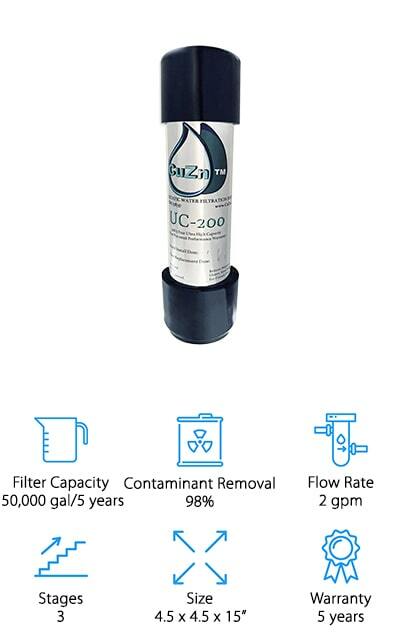 This filter removes 99.9% of lead, chlorine, heavy metals, and other contaminants. This includes bad tastes and odors. Your tap water has never tasted as good as it will with this filter. Plus, it features selective filtration, so it leaves all of the good stuff in while it’s removing all of the stuff that you don’t want. It flows at about 2 gallons per minute, slightly faster than your regular faucet! This is a great choice for city dwellers! APEC makes this WFS-1000 under sink water filter. The filter will last you for about a year, depending on how much you use it. It provides you with refreshing, clear water. You can use it with both city water and well water, so you can use it on your own country property as well as your house in the city. It has a dedicated chrome faucet that is entirely free of lead and has food-grade tubing so that your filtered water stays that way on its journey to you. If you find it isn’t working for you within the year, you can get a refund with no hassle. Otherwise, this filtration system is backed by lifetime support. You know that they stand behind their product if they are willing to deal with it for as long as it lasts. It includes all of the water adapters and tubing that you need to perform fast, simple installation. The CuZn under sink filter will last you an incredible five years, or 50,000 gallons of water. This system is designed for use with municipal water systems, so it is not recommended for use with well water. It will purify 98% of contaminants out of your city water, though, making it easier to drink! There are three stages in the filtration process, including sediment membranes, a KDF-55 layer, and a layer of coconut shell carbon to keep your water tasting great. The main benefit of this filter is that it removes chlorine and chloride, for better smelling water as well. Plus, it includes a bacteriostatic filtration system which discourages the growth of mold or bacteria. Don’t let the filter be the reason for the further contamination of your water. Everything you need is included, but CuZn also offers installation if you’re having trouble or can’t install it yourself. This filter does not require (or include) a dedicated faucet. This under sink water filter by Ecosoft is small, so it’s great for all of your sinks. Even the sink in your RV can benefit from amazingly fresh, pure water whenever you need it. It’s a kitchen sink water filter, but it isn’t bulky. It comes with a dedicated faucet that you can use in addition to your current faucet or in place of it. It will remove 99% of metals, impurities, and bacteria so that your drinking water is clear and delicious. It’s easy to install, and the switch from bottled water to an in-home filter can save you money and help the environment out. This filter lasts for an incredible 400 gallons before it will need to be replaced, so how long it lasts depends on how much you use it. The best part about this filter is the price! It’s affordable and effective, so you can get the perfect water for you at a cost you’ll appreciate. Hansing makes this under sink water filter, slated to remove at least 99.5% of contaminants like Chlorine, Chloramine, Mercury, and lead. Your water will smell better and taste better. The way the filter looks doesn’t allow bacteria to grow even after continued use. It uses activated carbon to filter out all of the stuff you don’t want in your water. This filter will last you an amazing 13,000 gallons before it needs to be replaced, so if you don’t use it a lot you’ll have fresh water for quite a long time! It comes with the brackets and installation materials you need, and it’s easy to set up. Save money by doing it yourself! The instructions are easy to follow. The carbon stays right where you want it because of the way the filter is made, reducing blockages in your pipes. This filter does it all, and it will fit neatly under your sink or cabinet. Culligan is one of the best-known companies for pure water options, and now that is extending to filters. This filter is a single-stage chloride and chlorine filter that improves the taste and smell of your water. You can easily replace the filter with the twist-off connections, no expert required. You can use it for under sink water filter fluoride removal with the upgraded filter. There are 3-stage and 4-stage replacement filters that will fit perfectly into this system if that’s what you’re looking for. 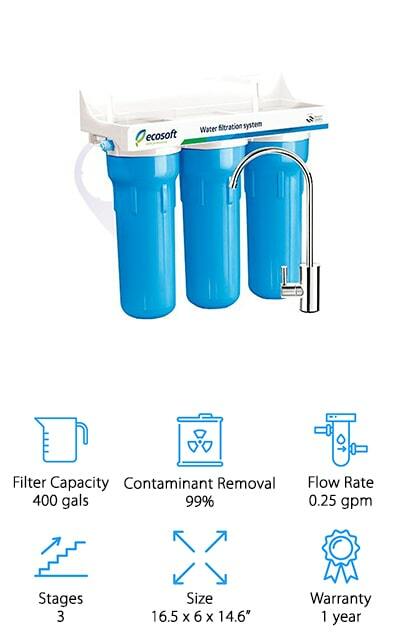 The default 1-stage filter is still pretty amazing at removing 97% of contaminants that affect the taste and smell of your water. Everything that you need to install this filter is included, right down to the dedicated faucet that dispenses crystal clear drinking water! This first filter will last you a year or 3,000 gallons of water, whichever comes first. Plus, it has a max flow rate of 5 gallons per minute! 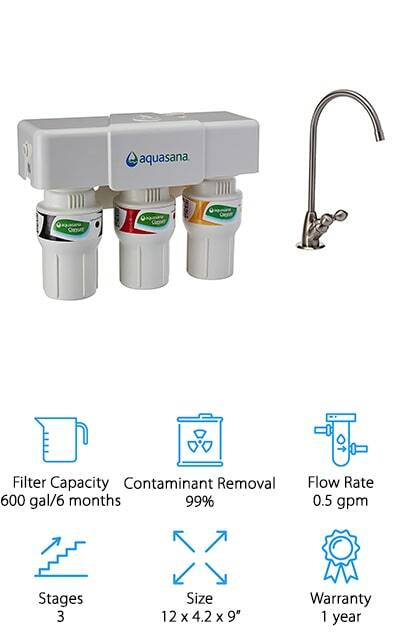 This filter by Aquasana gives you access to clear, great-tasting water instantly when installed below your sink. You can use it to remove up to 99% of contaminants; including lead, pesticides, and 75 other things that you don’t want to drink. This filter won’t add anything to your water and instead works on removing anything you don’t want your family drinking. There is no wastewater, so you aren’t harming the environment in any way – just helping your family! 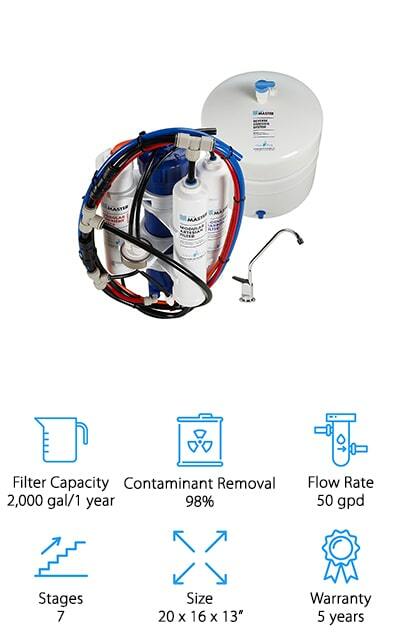 It has a sediment pre-filter with increased capacity so that the filter itself can work on removing all of the hard stuff. This filter will last you six months or through 600 gallons of drinking water. All the part you need to install, including the dedicated faucet, are included in your purchase. You won’t have to hire a plumber to get this system up and working. The faucet is stylish and lead-free, and it’ll look great in your kitchen!